Since we had two inches of rain yesterday in a 20 minute period of time, I felt today would be a good time to review some thoughts on Flood Insurance. I recently received a document explaining how to obtain a Flood Insurance Rate Map from the Environmental Services Division at Leon County’s Department of Development Support & Environmental Management (DSEM) from Anna Padilla, P.E. CFM, the Senior Environmental Engineer. Combined with yesterday's weather, I think it was an omen. According to FEMA, the highest ranked natural disaster in the United States is flooding. I suspect that to be true in Florida as well. 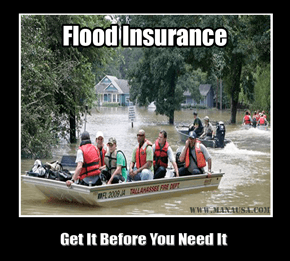 Most homeowners insurance policies typically DO NOT COVER flood damage, so you need to obtain flood insurance if you are in an area prone to flooding, regardless of whether or not the "flood map" tells you so. Of course, if you are in a designated flood zone, and you borrow money to purchase your home, your lender will require the additional insurance. Flood insurance is not always expensive, it just depends what zone your property is in. The best way to find out is to check out any property you are thinking about buying, which can be done during your "due diligence" time frame between contract and commitment to purchase. It is common for many homebuyers to ignore flooding, thinking most places in Tallahassee are high and dry. In fact, FEMA has designation the entire state of Florida as a flood zone, with varying degrees of risk. The prudent homebuyer will find out before making a commitment to purchase a new home. In order to get the information you need, make sure you have the street address and the parcel ID number ready. You can obtain the parcel identification number for any Leon County address at the Leon County Property Appraiser's web site. We like to encourage homebuyers to follow a proven process to save money when they buy a home. You can subscribe to our e-Series "Home Buying For Smart People" to learn how to ensure that you get the right house, at the right price, while saving money on all the ancillary services required during the home buying process. We can help you remember to get flood insurance when needed, as well as all the other helpful guidance that home buyers need. If you would like to know more about buying a home in Tallahassee, just drop me a note and we can schedule a time to put you on the right (dry) path to homeownership.